Genuine S30 valves have been around for many years and are still your best guarantee for a perfect brew when using home brew kegs. 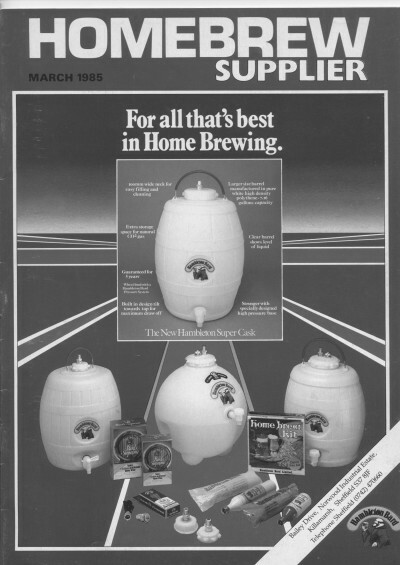 The Hambleton Bard S30 (also called Super 30) CO2 system for home brewing was created in the 1970's and the first major boom was during the early part of the 1980's when the S30 system was fitted to virtually every single home brew barrel for beer brewing sold in the UK. Here is a copy of the "Homebrew Supplier" from 1985 showing the then full range of S30 products. The barrels are from left to right, the 2" barrel (still available under many names today), the BeerSphere (a fantastic barrel, sadly now in the plastic heaven but we are thinking of reviving it) and finally the SuperCask. The SuperCask was the highest quality barrel, it would probably be too expensive to make today. You can see our famous S30 cylinders in front of the barrels plus its smaller sibling, the S20 cylinder. We don't make S20 cylinders anymore, but we still refill and refurbish them. How is that for long term service! In the year 2000 when the current family took over the company following the demise of Douglas Smith, we found a reminder of the glorious days in the 1980's parked in the yard. The Hambleton Bard trailer, no longer in working condition, but a solid reminder of the days of endless full lorry loads of barrels across the UK. Thanks to the S30 system, Hambleton Bard became the leading manufacturer of CO2 related products for home brewers. Today after some 15 years in hibernation, homebrew is exploding again and we are now planning a number of new items in the S30 range for the new generation home brewers. Keep an eye here, or on our main website www.hambletonbard.com for details of new products. S30 valves from Hambleton Bard work perfectly with the Hambleton Bard S30 system. Avoid any "compatible" brand as use of these will void the function guarantee of the whole system. For a genuine S30 valve + S30 cylinder, Hambleton Bard will guarantee the function and refill cylinders free of charge if there ever is a problem such as an uncontrolled leak. This guarantee does not apply to any valve or other product compatible with the S30 system but not manufactured by Hambleton Bard.